Local veterans listen to cheers from the crowd from the back of a trailer Thursday along Main Street. 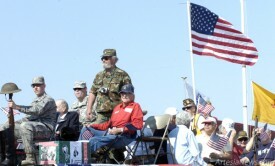 The veterans served as grand marshals of Artesia’s Fourth of July Parade. All over the community Thursday, residents celebrated Independence Day with recreational events, barbecues and concert going, culminating with the Sons of Thunder Pyro Team’s final fireworks display at Jyacee Park.